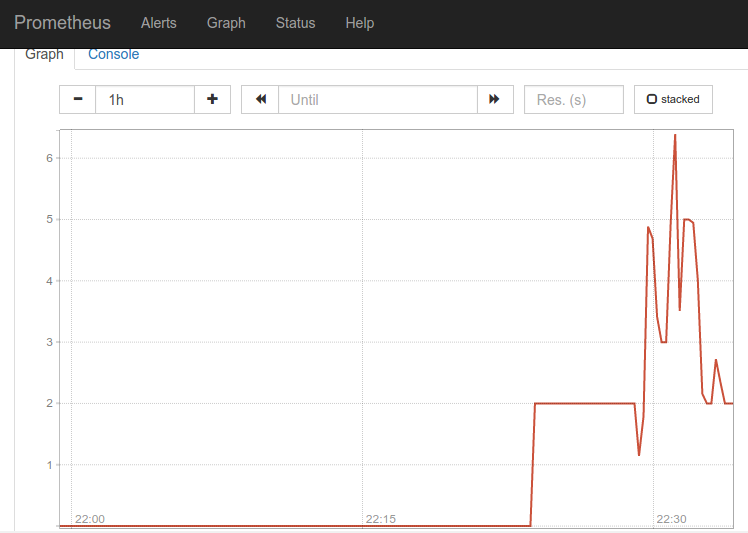 Use curl to download the latest build of the Prometheus server and time-series database from GitHub. The Prometheus monitoring system consists of several components, each of which needs to be installed separately. Keeping all the components inside one parent directory is a good idea, so create one using mkdir. Enter the directory you just created. Use tar to extract prometheus-0.16.0.linux-amd64.tar.gz. Prometheus was developed for the purpose of monitoring web services. In order to monitor the metrics of your CentOS server, you should install a tool called Node Exporter. Node Exporter, as its name suggests, exports lots of metrics (such as disk I/O statistics, CPU load, memory usage, network statistics, and more) in a format Prometheus understands. Enter the Downloads directory and use curl to download the latest build of Node Exporter which is available on GitHub. cd ~/Downloads && curl -LO "https://github.com/prometheus/node_exporter/releases/download/0.11.0/node_exporter-0.11.0.linux-amd64.tar.gz"
You can now use the tar command to extract node_exporter-0.11.0.linux-amd64.tar.gz. To make it easy to start and stop Node Exporter, let us now convert it into a service. Use vi or any other text editor to create a unit configuration file called node_exporter.service. Reload systemd so that it reads the configuration file you just created. At this point, Node Exporter is available as a service which can be managed using the systemctlcommand. Enable it so that it starts automatically at boot time. Before you start Prometheus, you must first create a configuration file for it called prometheus.yml. This creates a scrape_configs section and defines a job called node. It includes the URL of your Node Exporter's web interface in its array of targets. The scrape_interval is set to 15 seconds so that Prometheus scrapes the metrics once every fifteen seconds. You could name your job anything you want, but calling it "node" allows you to use the default console templates of Node Exporter. Start the Prometheus server as a background process. Use a browser to visit Prometheus's homepage available at http://your_server_ip:9090. You'll see the following homepage. 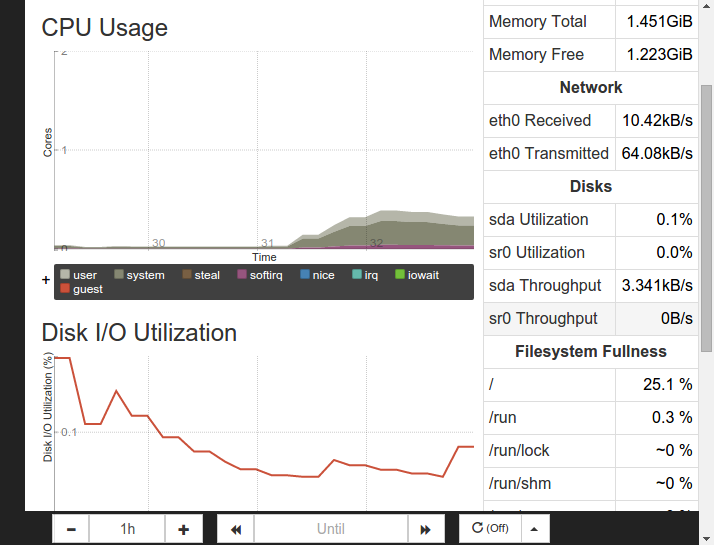 Prometheus has console templates that let you view graphs of a few commonly used metrics. These console template are accessible only if you set the value of job_name to node in Prometheus's configuration. Though the Prometheus server allows you to view graphs and experiment with expressions, it is generally used only for debugging purposes or to run one-off queries. The preferred way to visualize the data in Prometheus's time-series database is to use PromDash, a tool that allows you to create custom dashboards which are not only highly configurable but also better-looking. PromDash is a Ruby on Rails application whose source files are available on GitHub. In order to download and run it, you need to install Git, Ruby and a few build tools. Use yum to do so. You can now use the git command to download the source files. PromDash depends on several Ruby gems. In order to automate the installation of those gems, you should install a gem called bundler. Gems in the groups mysql and postgresql were not installed. Create a directory to store the SQLite3 databases associated with PromDash. In this tutorial, you will be running PromDash in production mode, so set the RAILS_ENV environment variable to production. Apply the changes we made to the .bashrc file. Next, create PromDash's tables in the SQLite3 database using the rake tool. Wait for a few seconds for the server to start and then visit http://your_server_ip:3000/ to view PromDash's homepage. 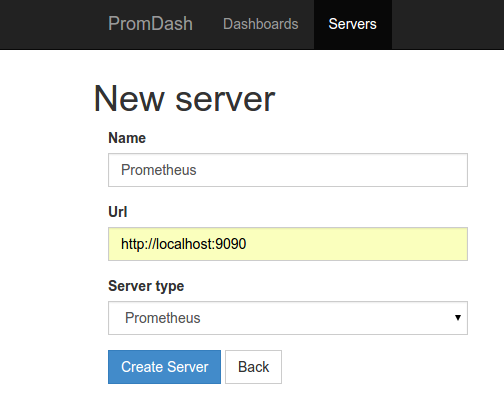 Before you start creating your custom dashboards, you should let PromDash know the URL of your Prometheus server. You can do so by clicking on the Servers tab at the top. 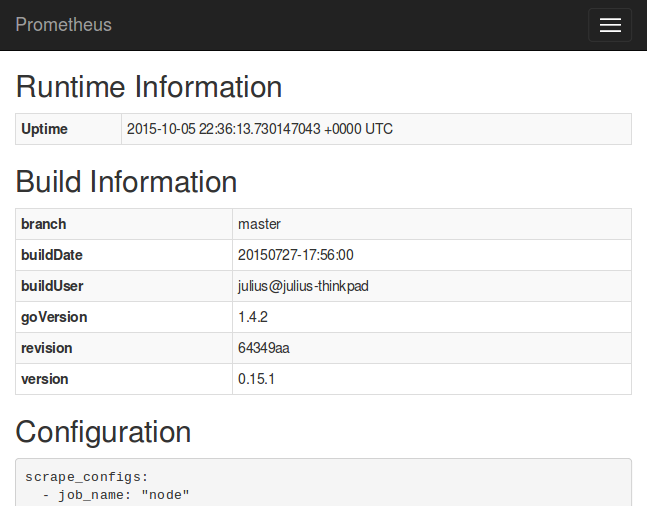 Click New Server, then in the form, give any name to your Prometheus server. Set the Url field to http://your_server_ip:9090 and the Server type field to Prometheus. Finally, click on Create Server to complete the configuration. Your page will say Server was successfully created. and you can click back to Dashboards in the top menu. Because a Promdash dashboard should belong to a Promdash directory, first create a new directory by clicking on the New Directory. 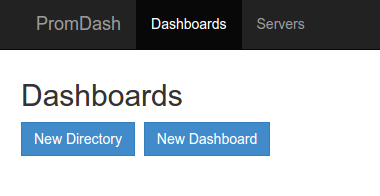 In the form that shows up, give a name to your directory, like My Dashboards, then click Create Directory. Once you submit the form, you will be taken back to the homepage. 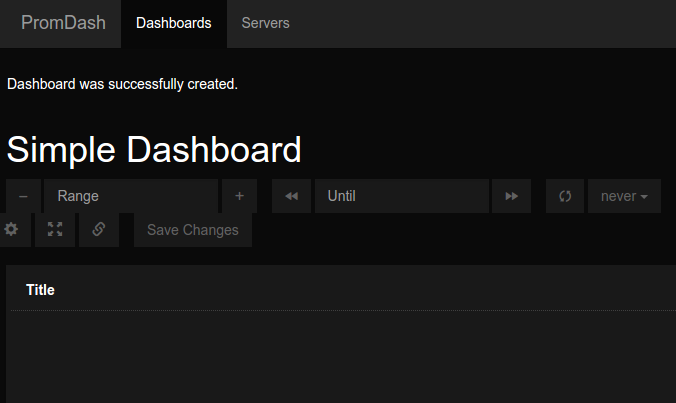 Click on the New Dashboard button now to create a new dashboard. In the form shown, give a name to your dashboard, like Simple Dashboard and select the directory you just created from the drop-down menu. After submitting the form, you will be able to see the new dashboard. Your dashboard already has one graph, but it needs to be configured. Hovering over the graph's header (which says Title) will reveal various icons that let you configure the graph. To change its title, you can click on the Graph and Axis Settings icon (fourth from the left) and type in a new title in the Graph Title field. Click on the Datasources icon, which is the second to the left, to add one or more expressions to the graph. 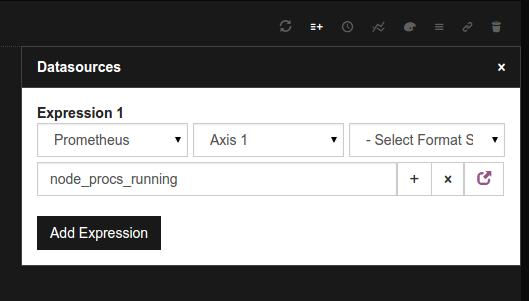 Click Add Expression, and in the field that says Enter Expression, enter nodeprocsrunning. Now click on the Refresh icon (the leftmost one) in the graph's header to update the graph. Your dashboard now contains one fully configured graph. You can add more graphs by clicking on the Add Graph button at the bottom. You now have a fully functional Prometheus ecosystem running on your CentOS 7 server, and you can use PromDash to create monitoring dashboards that suit your requirements. Even though you installed all the components on a single CentOS machine, you can easily monitor more machines by installing only Node Exporter on each of them, and adding the URLs of the new Node Exporters to the targets array of prometheus.yml. You can learn more about Prometheus by referring to its documentation.